This case was first reported by the Associated Press, Johannesburg, S. Africa, Sept.17, 1965, and first published in the United States by NICAP. 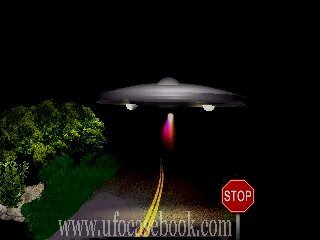 The first information was related by UFO investigator and writer Richard Hall. This case, though not heavy in detail, features a vehicle encounter, UFO landing, and physical traces, along with official secrecy. The events occurred as Constable John Lockem and Koos de Klerek were doing routine patrol on the Pretoria-Bronkhorstspruit road. It was just past midnight when to their utter amazement, the lights on their police van lit up an object ahead of them on the road. Sitting right on the highway was a disc-shaped object. The object was not anything they had seen before. With the object lit up from their headlights, it appeared to be of a copper color, and was about 30 feet in diameter. After only a few seconds, the UFO began to rise above the road, and quickly sped away throwing flames from double tubes of some type on the bottom. The two men must have been in awe, wondering from where the strange, unknown object had come from, and where it was going. Later as the men reported their unusual encounter, Constable Lockem stated: "Its lift-off was quicker than anything I have ever seen." Flames from the asphalt road had shot up into the air about 3 feet, according to the witnesses. The heat was so intense that the fire lasted for a time, even after the object had zoomed away. Further investigation indicated that parts of the road had caved in, as if from a heavy object resting on it. The gravel had been separated from the tar in an area severely burned about six feet in diameter, indicating the center underneath of the UFO. An official investigation into the incident was carried out by Lt. Col. J.B. Brits, District Commandant of Pretoria North. In an interview for a local newspaper, Brits told reporters that the case of the UFO landing was considered "as being of a highly secret nature and an inquiry is being conducted in top circles." Samples of the damaged road material were taken by a scientific agency for analysis, but the results were never released to the public. Because of the location of the event, and its age, it is unlikely that more information will be forthcoming. Source: UFOs: A New Look (NICAP 1969); Associated Press, Johannesburg, S. Africa, Sept.17, 1965.